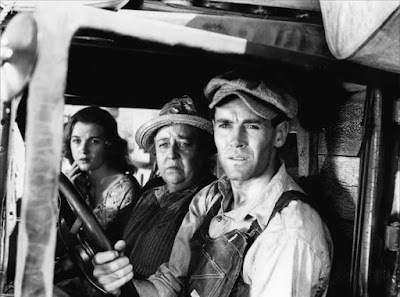 Today, I'm writing about the Joad's journey from Oklahoma to California in The Grapes of Wrath (1940). This production still shows Dorris Bowdon (left), Jane Darwell, and Henry Fonda packed into the front seat of the family's Hudson Super Six Sedan. This article is part of the Classic Movie Blog Association's Fall Blogathon on Planes, Trains, and Automobiles. About 20 minutes into director John Ford’s masterpiece The Grapes of Wrath (1940), the Joad’s, a dirt poor family of Oklahoma sharecroppers, cram themselves into a broken down truck and head to California. The family, led by oldest son Tom (Henry Fonda) and the indomitable Ma (Jane Darwell), are looking to escape the horrors of the Dust Bowl for the so-called “land of milk and honey,” where they believe they will find prosperity as migrant workers. Early one morning, they load up the truck with all their earthly possessions and begin one of the most harrowing automobile journeys in American cinema. For many Americans in 1940, the Joad’s plight was not just another onscreen adventure. The Great Depression, which began in 1929, had adversely affected virtually every man, woman, and child in the nation. Millionaires saw their life savings wiped out in the stock market crash, able-bodied men begged for work on street corners, and hundreds lined up at soup kitchens for their daily bread. However, no one experienced more misery than those Americans who survived the Dust Bowl, which was one of the worst environmental disasters in American history. The Joads head to California in The Grapes of Wrath (1940). Much like the Joad’s, many farmers scratched out an arduous living on the Great Plains. Their already precarious existence was made worse by a drop in wheat prices and a severe drought, but that was nothing compared to the devastating dust storms that were caused by hundreds of acres of eroding topsoil. The storms began in South Dakota in 1933, but they soon encompassed the entire region. Terrified residents watched as gigantic black clouds totally enveloped their homes and farms and even blocked out all sunlight for days (the remnants of one storm made it all the way across the East Coast causing red snow to fall on New England). “We and our misery were covered in dust,” one Texas farmer remembered. The Grapes of Wrath begins after the worst ravages of the Dust Bowl. Tom returns from a stint in prison for manslaughter to find out that the family farm has been foreclosed. The entire Joad clan is camped out at his uncle’s house preparing for the journey to California in a dilapidated 1926 Hudson Super Six Sedan. The Joad’s odyssey through five states is central to The Grapes of Wrath, and it is both heartbreaking and life-altering experience. 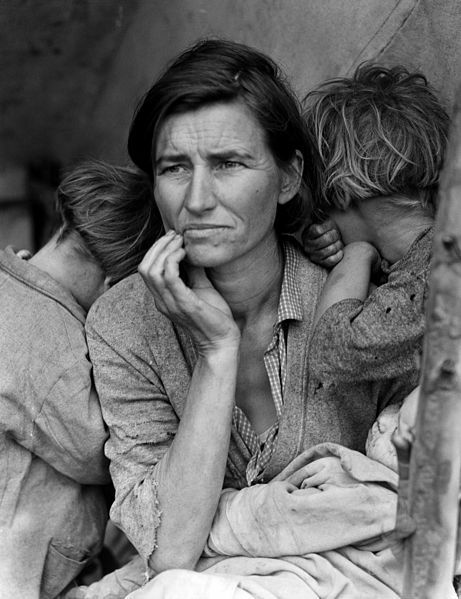 This archival photo by Dorothea Lange shows migrant worker Florence Thompson with her children in 1936. The genius of Ford’s film is that he not only makes the Joad’s fully human, but these characters, especially Ma and Tom, transcend their surroundings to became archetypes of the plight of displaced people in all nations The film was an international hit in its initial release, especially in the Soviet Union, although Soviet leader Joseph Stalin banned it after disgruntled citizens complained that even the poorest Americans had cars. Each family member is given a distinct personality, whether it’s Grandpa’s taste for spareribs or Rosasharn’s (Dorris Bowdon) desperate love for her faithless husband (Eddie Quillan). However, the film hinges on the personalities of Ma and Tom, both in their relationship to one another – the movie’s best scene is their sentimental dance to “Red River Valley” – but also how each character reacts to terrible forces that are breaking their spirit and tearing their family apart. Tom begins The Grapes of Wrath as a hotheaded young man spoiling for a fight, but he ends the movie as a noble crusader for the underprivileged, giving the famous “I’ll be everywhere” speech that defined Fonda’s career and his public image. One of Gregg Toland's signature mirror shots featuring Jane Darwell. 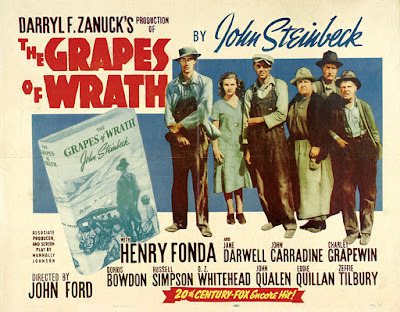 Fonda gives an exceptional performance, but he is significantly helped by the way The Grapes of Wrath is photographed. Legendary cinematographer Gregg Toland was the director of photography, and he got his pre-Citizen Kane (1941) warm-up in with a masterful use of shadows and night scenes. Tom’s journey from small-time criminal to patron saint of the dispossessed is visually illustrated by Toland and Ford’s use of light and shadow. Tom begins the film as a completely black figure surrounded by sunlight, while he ends the movie as the only light in a dark room. The Grapes of Wrath is available on DVD, Blu-ray, and video on demand. The information about the Great Depression and the Dust Bowl and the quotes from eyewitnesses came from This Fabulous Century: Vol. IV 1930-1940 by the editors of Time-Life Books and The Hungry Years: A Narrative History of the Great Depression in America by T.H. Watkins. 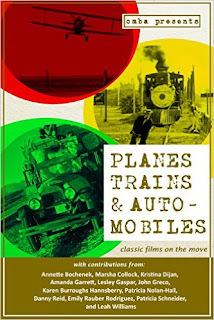 If you are interested in a compilation of articles about Planes, Trains, and Automobiles you can download the CMBA's new e-book on Amazon or Smashwords. What a GREAT choice for the blogathon. Aside from being a great film for all the reasons out outline, that old truck was a godsend for the Joads. Without it, they would have never gotten out of the dust bowl. Excellent post - I really enjoyed it. Thank you. I really enjoyed writing it. That truck really was the Joad's lifeline because I read in the books about the Great Depression that some people tried to hitchhike or walk to California. That ramshackle truck was the Joad's lifeline. Excellent selection and piece for the blogathon. Once, after seeing this film on the big screen, my sister and I turned to each other with tears in our eyes and called Gregg Toland a showoff. Such beauty to highlight such misery. You are so right about Toland being a showoff. That's why Citizen Kane was the perfect movie for him. The Joads were too poor for 30 mirrors. I'm so excited you posted this. I just bought a copy of The Grapes of Wrath on blue-ray & can't wait to see it this weekend. I'll be keeping some of your points in mind.